You can sign up for the alpha now. You may remember reading about Samuel’s adventures while playing New World at Gamescom. 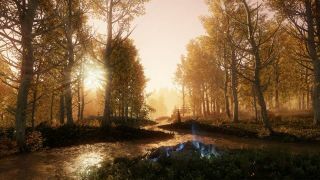 If blowing up neighbouring clan’s walls and killing their leader isn’t quite your thing, you’ll be pleased to know that Amazon’s new MMO has a lot more to show off—including some impressive and diverse environments, as seen in the screenshots below and shared on the game's Twitter account. From eerie woodland to oppressive mountain ranges, we're shown the variety of settings that New World offers. The bleak Damned Capital contrasts with the warm, homey-feel of one of the outposts. While content is clearly an important factor in any MMO, I find diversity as well as detail in locations to be important. The anticipation of discovering new areas and zones is what drives me to continue playing when first starting out.